Love Birds Owl Style ! Cute Christmas gift for you and your loved one! Take a look at these cute Owls.., on the tree branch and the heart in the tree trunk. 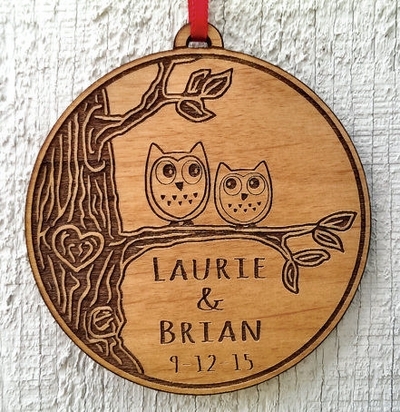 It is made from sustainable wood, about 3" in diameter, so your keepsake will last without breaking. Nice and large. Comes with adorable red ribbon and it is packed in delicate organza bag, ready to give as a thoughtful gift.